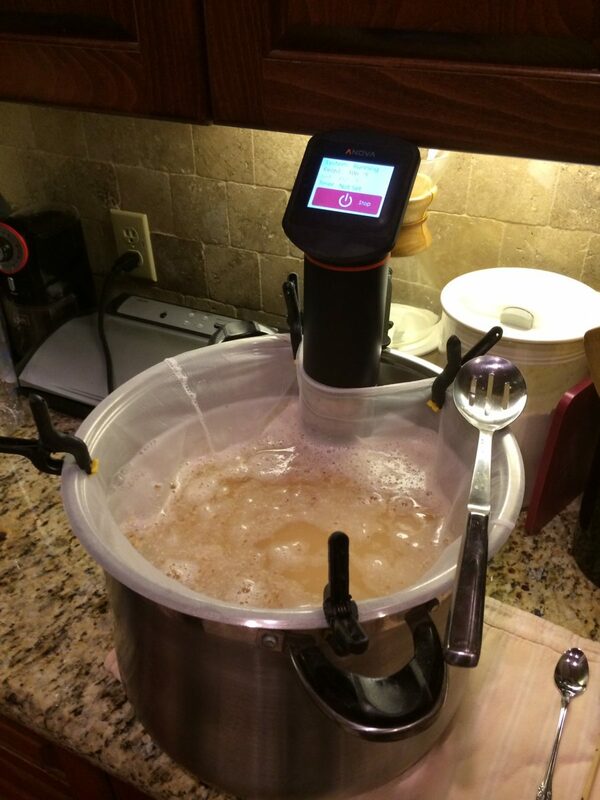 What happens if I use the immersion circulator (IC) to regulate mash temperatures and provide some agitation in a small batch BIAB scenario? To be clear, I am not suggesting mashing under vacuum or any such nonsense, although once could envision such with the right vessels. Rather, I am replacing a gas stove element, with a smaller 1000W electrical element, AND perhaps getting some additional benefit from agitation of the wort. 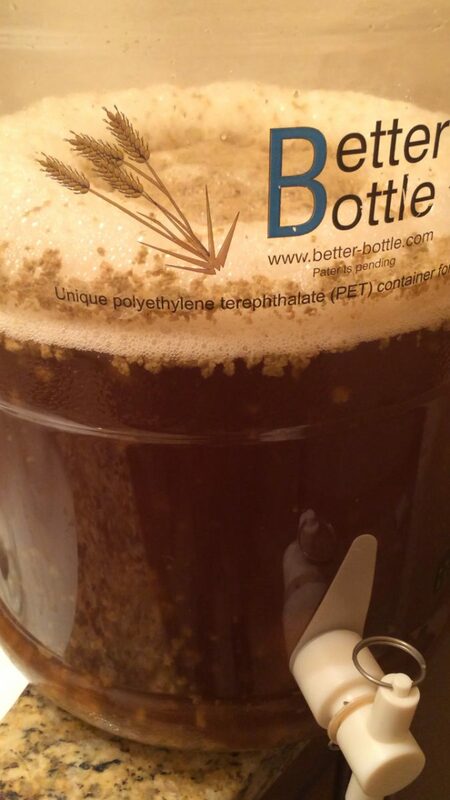 The Experiment consisted of a 3-gallon recipe, with the additional experimental component of fully fermenting under Brett. I created a Cascade Saison Brett recipe, prepped the grains (same crush as I use for the Brew Magic), acidified the water and struck at a thinner 2.25 qt/lb mash. 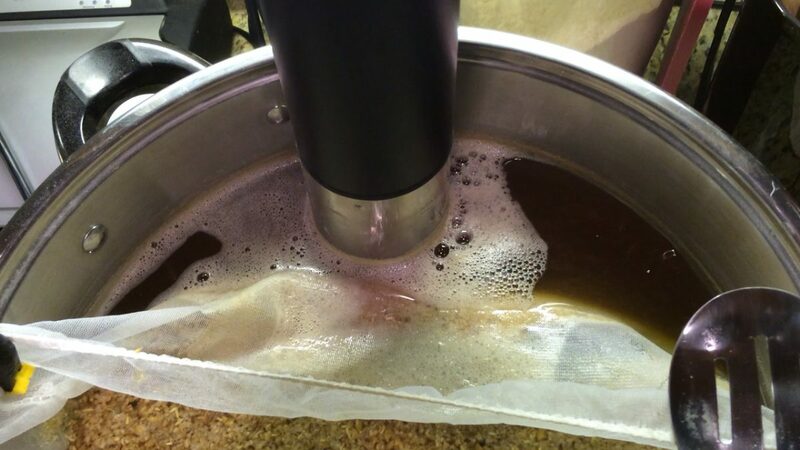 The reasoning being, a thinner mash should allow better recirculation through the IC. Also, I was not sure how much volume the IC would take – so started with a 2.5 gallon strike and ended with 3.5 gallons, as there is a minimum fill requirement for the pump to function. I also struck for a 5.2 mash pH, and ran it a bit lower, but didn’t make any adjustments. This is an experiment after all. Note that I have the bag wrapped close to the IC, which may have blocked the pump slightly. My first mistake, which I didn’t realize until I was ready to mash in – was that the water, without the displacement of the grains, did not allow the IC to run. Again in the spirit of experimentation, I jumped right in and allowed the mash to rise steadily from 78F to 154F. Below you can see the initial setup, after stirring vigorously to eliminate dough balls, I set the IC and set an alarm to indicate when 154F was struck. In the future, I will use the IC to strike the right temperature for the full volume of water, then pour off the sparge volume. At various points along the way, I would rejigger the bag placement. You can tell with the sound of the device if the pump is struggling – and it was. With the bag against the inlet ports of the pump, the wort was not effectively moving through (resulting in a problem I will reveal later). I seemed to find the sweet spot with the 5 gallon pot, by moving the bag to about half of the kettle. This left a large amount of fluid to run through the IC, and still provided turbulence inside of the bag. It also demonstrated that while the free wort was at the desired temperatures, the mash lagged by about 2 degrees, so I made an adjustment and brought the temp up. The IC held the temperature very stable over the 60 minute rest at 154F and the timer was very convenient. Ramp time from 90F to 154F was about 20 minutes. 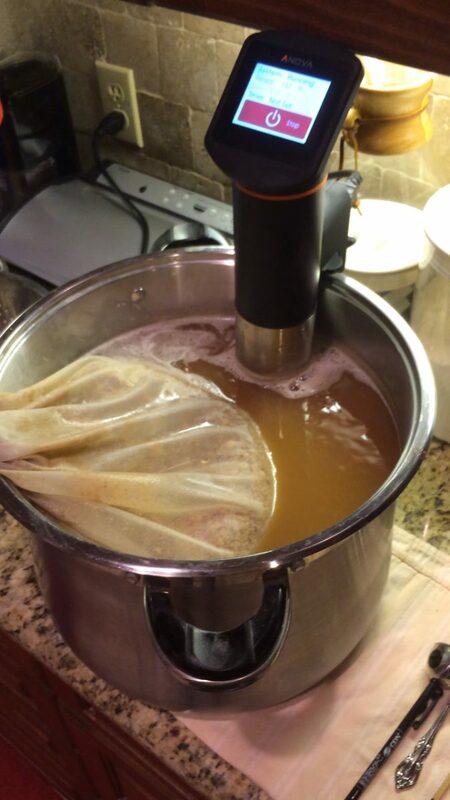 I was able to mash out at 170F, and gathered up the bag and drained it in a colander over the kettle. I rinsed with just 1 gallon of cold RO water, rather than a dunk sparge. This was a mistake as my extraction efficiency dropped down to around 64%, from my planned 75%. Note: for those that chase high efficiency, I have accepted and usually range at 76%. Issues with finer crush, with a RIMS system, require me to grind course, and acceptably add a tiny bit additional grist to make up the points. When doing BIAB, I have not yet found the right crush. So crushing finer would result in better extraction in this case – but I did not account for it. Once I took out the IC from the wort, I smelled something burned. Will talk about this in a minute. While the grist dripped, I started up the fire for the boil. I decided not to up the gravity points with DME, rather let this ride as appropriate. Everything with the boil went as planned, three additions of cascade pellets, chill down and into my new favorite “Sours Only” carboy. I hit it with oxygen for a couple of minutes, until a nice foam set on the top, and pitched a large slurry of dregs (mostly Brett, maybe others) from Roeselare and Damnation. Fermentation took right off. Now to wait at least 4 weeks to see what is going on. A pellicle did not form right away, and I stalled it a bit by accidentally adding some sulfured dry peach fruit. Fermentation continues, so hopefully it will complete. 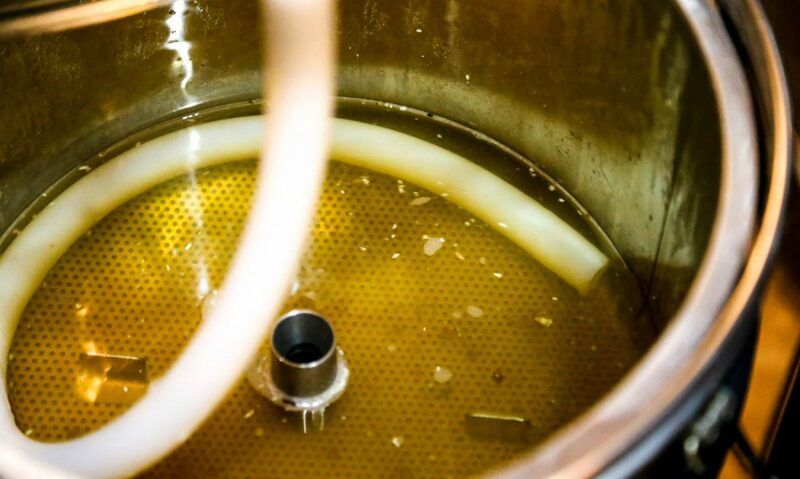 Ensure that there is plenty of fluid around the IC, to keep wort moving quickly across the heating element. Work in an appropriate sized tun (pot) so that your volumes work well with the min/max level requirements for the pump. 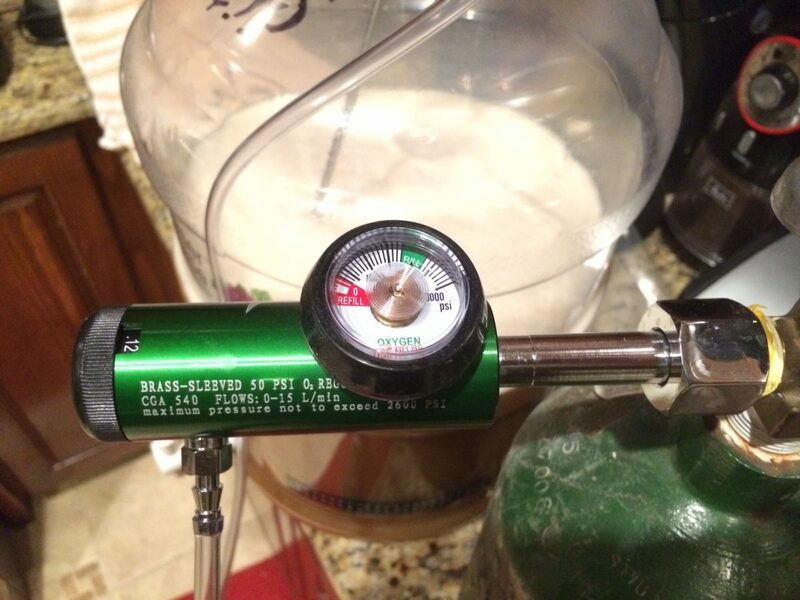 Use a tool like Beer Smith to calculate. Do not allow the bag to block up the inlets or outlet to the pump at any time. Preheat your water before mashing in. You can do step mashing with the IC. The burned smell turned out to be wort that carbonized on the heating element. AND impossible to clean up. The coil and the probes are just too tight to effectively scrub. I resorted to overnight soaking in a strong PBW solution, which softened the crud enough to scratch off. I suspect that the wort flow through the pump was blocked enough to cause the blackening. Hard to say for sure. Another test is needed – it maybe that it isn’t flow related. I definitely believe that a finer crush would have caused more issues. A quick note on the PBW soak: You cannot turn on the IC in PBW. There are sensors that use conductivity of the water to determine if the minimum level is reached. For some reason, the PBW caused the tolerances to be off – resulting in a SYSTEM ERROR. Happily, it works just fine with standard tap water. So soak without the heating element and pump running in very hot PBW overnight, and rinse. Then run it in some water with a little vinegar. The carbonized crud will flake off. Not related to the IC, I should have used a hot dunk sparge, or converted over to a full volume mash. 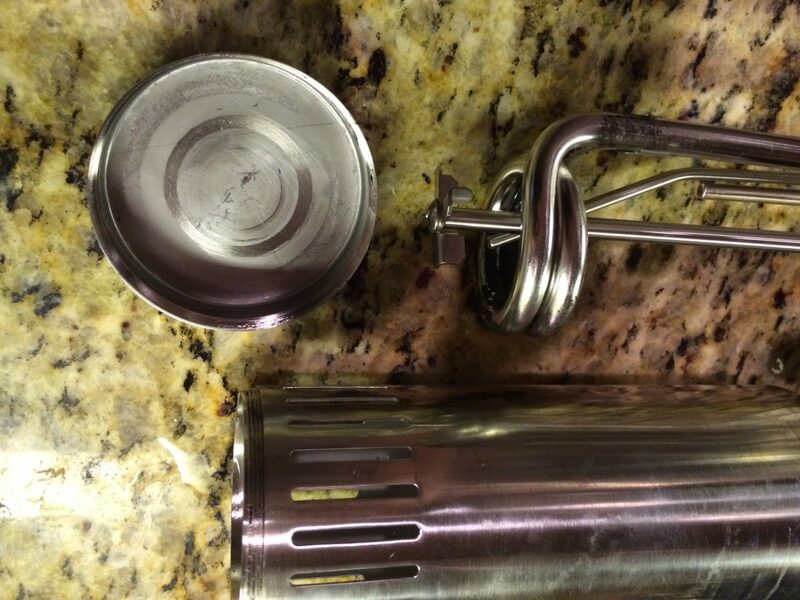 The full mash volume just wouldn’t work with the IC in place, and would have overflowed. I had hoped the top up with sparge water would be adequate, but it was not. I would like to mash thicker next time, so perhaps using mason jars or other devices to manipulate the volume might have a better result. Because so many of my recipes are step mashed, it is a nice and convenient addition to my test batches, eliminating the frustration of using such a hot fire. So a fun experiment with mixed results. I am sure that with some modification, the IC would work very well in this scenario and I hope to give it another try. As for the recipe, lets see how this goes… and make sure it tastes decent before putting a recipe up!